At West Oso Junior High School, we are a united family of educators and learners. Together, we have created a Gold Star Campus where our 461 sixth through eighth grade students gather with the intent to grow and develop intellectually and socially. Students attending WOJH benefit from a low student-to-teacher ratio. Our small size ensures that all students receive individualized attention from our highly qualified teachers, maximizing their learning potential. 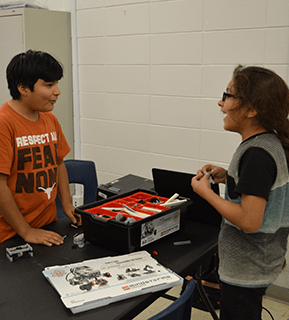 From competitive sports to academic contests to music and fine arts, West Oso Junior High School provides students with opportunities to develop physically, academically, and socially by engaging in extracurricular activities. You can learn more on our Programs and Activities page. WOJH is fully equipped and prepared to teach students at all learning levels. We offer ESL (English as a Second Language) enrichment courses and special education. We believe every child can learn and are passionate about meeting the needs of every student on our campus.